Access to more detailed, geographically focused data sets, combined with the developed of more sophisticated mapping (GIS) systems, have made the Redistricting (gerrymandering) process more sophisticated. This has allowed the party in power, whether Republican or Democrat, to increase the likelihood of electing the majority of seats at all levels of government. This was quite clear in Michigan where Democrats won in overall Congressional votes in 2012 but lost 9 of 14 races. The results of the August 5 Primary are in and Michigan voters registered a paltry 18.1 percent turnout rate – less than 1 of every 5 registered voters in the state either made it to the polls or submitted an Absentee Ballot. Some might use the excuse that primaries require voters to select a party affiliation, a requirement that they reject. I agree that this needs to be changed but should not be used as an excuse not to vote at all. Others might say that the top positions – Governor and Senator were uncontested. That might be but there were many other contests and local proposals that were contested. So, in addition to 18 percent of the electorate deciding the statewide proposal on Personal Property Taxes, fewer voters, in many cases, decided on their ultimate representation in the State House and Senate, as well as local millages and ballot initiatives. Based on official turnout results, both Macomb and Wayne counties voted at rates less than the statewide total – 17.0 and 17.8 percent, respectively. Oakland County came out slightly ahead of the average at 20.6 percent. I decided to take a look at the turnout in each of the cities and townships in Oakland County to understand how the diversity of the country translates to voter participation. One must understand that each community had the Governor and Senator races on the ballot, as well as Proposal 1. Each also had a U.S Congressional race – some contested and some not – on the ballot, as well as State House and Senate races – most of which were contested. Finally, all communities that had previously opted into Public Transportation had a SMART Millage increase to vote on, and many had tax proposals, marijuana ordinance changes and other assorted issues. 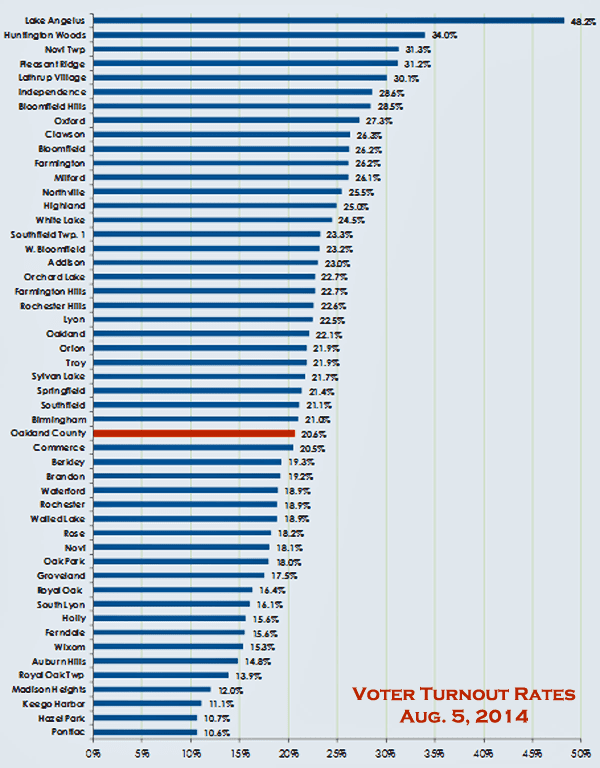 A ranking of communities (see Figure1) shows that turnout rates ranged from a low of 11 percent (rounded) in Pontiac, Hazel Park and Keego Harbor to the high end where five communities surpassed a 30 percent turnout – Lake Angelus (48.2%), Huntington Woods (34.0%), Novi Twp. (31.3%), Pleasant Ridge (31.2%) and Lathrup Village (30.1%). While their turnout rates must be recognized, it should be pointed out that Lake Angelus has but 282 registered voters and Novi Twp. has just 128. While the country celebrated the turnout that accompanied Barack Obama’s first election – particularly among young voters and persons of color – these numbers have not held up. It is clear from the Oakland County Primary results that communities with lower income and lower educational attainment (with some exceptions) had the lowest voter turnout. It is critical that efforts are made in schools, in churches and through social service organizations to increase the vote in these communities. Distrust in government and a feeling of “they don’t care about us” is not a reason for not voting. Rather, it is exactly the reason to vote and show the politicians that they need to pay attention to you. Statewide Democratic candidates have increasingly campaigned less and less in Detroit because turnout is historically so low and the vast majority of voters who go to the polls vote Democratic. Communities such as Pontiac, Hazel Park, Royal Oak Twp., and Madison Heights will continue to experience less attention if they cannot put forth a stronger showing in November. There is no greater example of civic participation than going to the polls and voting. African Americans and women fought for years for this right in our country. People around the world are fighting for this right today and, when they get it, are willing to stand in lines for hours and hours to complete that ballot. We, on the other hand, complain if our wait is more than a half hour at best. The candidates from each party have been selected for the fall races. I challenge all Oakland County residents (and by extension, all Michigan registered voters) to get to the polls in November. Voting is both a RIGHT and a DUTY. The State Elections Division provides counts of Total Registered Voters and Active Registered Voters. The Active Total disregards voters who have not participated in six years. Due to election law, voters stay on the roles even though they have not voted for six years. Some may indeed be apathetic nonvoters, but others may have moved or died during this time and have yet to be taken off the roles. The rate of turnout rises to 20.5% statewide; 19.0% in Macomb; 22.9% in Oakland; and 20.6% in Wayne, when only the Active Voter total is used for registration. While neither the State of Michigan or the Oakland County Elections Division provides counts of Active Registered Voters for communities, it is obvious that local registered voter counts may be rather inflated, thus leading to lower turnout values. Pleasant Ridge is a perfect example of this phenomenon. The 2010 Census enumerated 2,012 Pleasant Ridge residents of voting age (18 years+). New population estimates have only changed that total slightly. However, the Registered Voter total for Pleasant Ridge in 2014 is 2,318 – 300 more than should be eligible. There are many reasons that people stay on registration lists, but the end result is that they do not participate and result in turnout rates that are biased lower that actual.